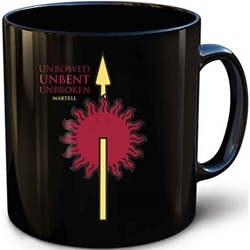 Our Game of Thrones Martell Sigil Mug features the Unbowed, Unbent, Unbroken. Follow us to the vast world of Westeros, where the kingdom's seven noble families vie for control of the Iron Throne. Now you can bring a piece of Westeros into your own castle with our new Martell Mug, emblazoned with the Martell Sigil and powerful House words: Unbowed, Unbent, Unbroken. This item is a must-have for any Game of Thrones fan.